Jan and Nieske Hoogenhout became well-known and liked locally when they opened their bakery in Sheffield, Tasmania. Jan made the best pastries in the area, and Nieske would remember all the children's names who came into the bakery. They made an effort to be part of the community and when hardship befell the family, they were embraced by the town. In 1968, John developed bone cancer in his leg and had to have it amputated. It was a difficult time for the family but they felt supported. ‘Sheffield was a small town,’ Ineke, the eldest, says. ‘People felt really involved.’ John was one of the first Australians to undergo the surgery successfully and recovered with remarkable speed. 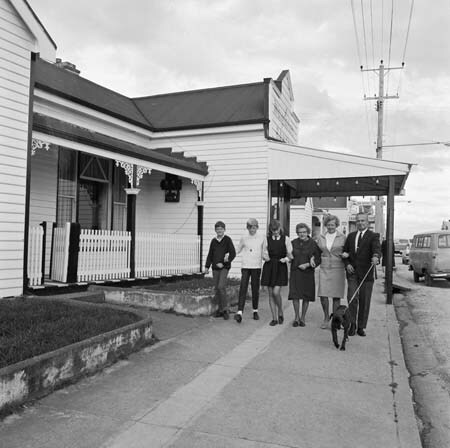 In these circumstances the family was photographed outside their bakery in 1969. Eddie vividly remembers the government photographer taking it. John’s prosthetic leg was quite new. ‘We were all still getting used to John’s leg. We had to take several practice walks around the block to get it right for the photograph,’ Eddie said. ‘It swung out a lot,’ Ineke adds. Quotes from interview with Ineke Laning and Eddie Hoogenhout, January 2012.